I am a dirty criminal in the night time and my offense is the frequent public consumption of dollar canned wine from Trader Joe’s. Frankly, I think Trader Joe’s knows exactly what kind of game they’re playing. 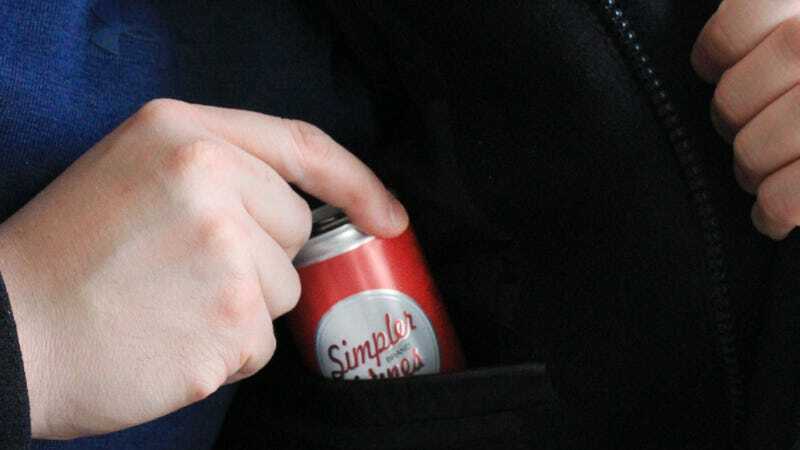 Their sparkling Simpler Wines is priced at a meager $4 a four-pack and each slimline can is 187ml, which is essentially the perfect size for hiding in a pocket or (in my wife’s case) the bottom corner of a purse. The first offense happens at a screening of Poop Talk, a film that a friend is seeing as part of a documentary club she belongs to. I wait until the upswell of music at the start of the film to hide the pop-hiss of the can opening and I feel my adrenaline surge as the scent of low-quality canned wine hits my nostrils. Sure, it tastes stale and is so cheap that an Italian vintner probably wouldn’t wash their car with it, but at a dollar a can it’s economical enough to silence my internal complaints. Also, it is wine, which is reason enough. Illicit movie wine has now become a reliable part of my entertainment life, and feeling the cool chill of the can inside my pocket as I walk past theater security is a balm for my agitated soul. A screening of Black Panther is accompanied by, according to whoever wrote the ad copy for the Simpler Wines’ white varietal, features “notes of juicy honeydew and fresh cut herbs”, which, no. But still! So cheap! And so illegal! I am bewitched. The full online advertising text reads with a wink and a nudge: “With no fancy opener or glassware needed, Simpler Wines dare to venture where their bottled brethren can only dream. Picnic at the beach or concert in the park? No problem.” I don’t find a bottle opener to be a particularly fancy piece of equipment, but yes, no problem indeed. You say “picnic at the beach” and I say “the AMC at 68th street on Broadway.” We are kindred spirits. I pair the rosé (which I strongly prefer over the white) with a screening of A Wrinkle in Time and wish I had brought more than one can. Is this why people carry flasks? I tried carrying a flask once while in grad school but it’s hard to be a “flask guy” without also seeming like an “alcoholic creep.” I look at my can and decide 187ml of wine is an acceptable amount to secretly drink in a crowded albeit dark public area. When the porter walks down the theater aisle with his crimson glowing baton I wonder if I’ve been made and I cover the can with my hand. He strolls briskly down to the emergency exit instead and I feel my heart rate slow. I will live to drink another day.